Dental implants – Is it cheaper and better to go abroad like Hungary/Poland then have them placed in Manchester? We get asked this question many times, and unfortunately there is no set answer. Some clinics abroad like in the UK are very good and some are not so good. Researching the clinic you are thinking of going to is really important as it is when you go to a dental implant in Manchester. At our clinic implants are placed by Dr Rob Adams and restored by Dr Tariq Idrees. We use one of the best dental implant systems in the world – Astra Dental Implants and our failure rates are less than 1% after 5 years. Astra dental Implants have success rates of over 85% over 20 years which is the gold standard. 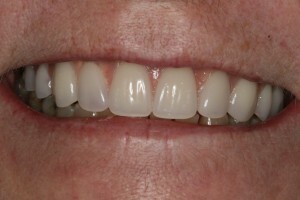 This patient had dental implants placed in Turkey 5 years ago. 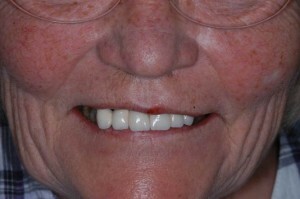 They took her teeth out and placed dental implants and the next day placed a porcelain bridge over the implants. She is fit and healthy and does not smoke. Unfortunately after 4 years the implants cracked and she lost large amounts of bone in her upper jaw. 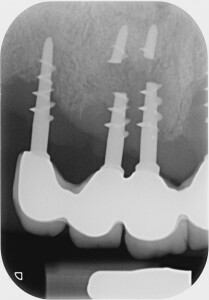 We had to remove the broken implants and replace the lost bone, this is specialist work and was completed by Dr Adams. After the new dental implants had healed which took 10 weeks, Dr Idrees constructed a dental implant bridge for the patient.